Installing Hot Tub Ozonators is not difficult. Most spas made today come ozone ready, which means your hot tub manufacturer has done most of the work for you. Even if your hot tub is not ozone ready, reading through this instructional guide will simplify the installation. If you are replacing an existing ozonator, you can simply connect to the existing ozone tubing and the replacement should only take a few minutes! Ozonators are normally installed underneath the spa cabinet, however, it may be necessary to install it near the equipment of an in ground spa, on the wall of a hot tub room, or in a dry place under your deck. Good air flow around the ozonator is important and it should be mounted firmly. 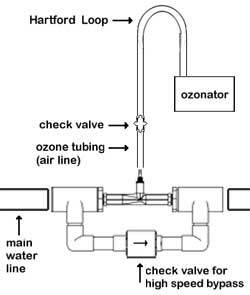 Many instruction manuals state that an ozonator should be installed above the water line to prevent water from back-flowing into the unit. This is usually not possible, so check valves are included and should be used regardless of where you mount it. A Hartford Loop is also recommended to prevent water from getting into the unit. Proper use of a check valve and Hartford Loop are explained later in this article. Is your spa ozone ready? Most spas that are ozone ready will have a tiny jet (often near the bottom of the spa) that is pre-plumbed for an ozonator. There is a water port and an air port on most hot tub jets. Even if you didn't elect to buy an ozonator with your spa, the water port will usually be plumbed and water will flow through the jet when your main pump is on. The air port will either be capped off or clear tubing will be connected with the end hanging conveniently in the equipment area ready to connect to an ozonator. If you are fortunate to have an ozone jet, connecting the clear tubing will only take a couple of minutes. Some hot tubs come ozone ready with an ozone jet plumbed and a convenient place to cut the water line. In these instances, refer to option a below and install an ozone injector on the water line. An easy and effective way to hook up the ozone line is to use an ozone injector. Cut the water line leading to a jet (choose a jet near the bottom of your spa if possible) and glue in the injector. Then connect the ozone line to the barbed fitting on the injector. If your spa has looped jetting (all jets are on a continuous circuit), use a bypass assembly as in option d below. If you can access an individual jet, you can plumb it directly to the air orifice of the jet. If your spa has looped jetting, your jet will have air going in one side and out the other side to the next jet. Cut this jet out of the air loop and then reconnect the loop with 2 couplers and a length of flexible hose so you bypass the air on the jet you plan to use. Connect the ozone tubing to one side of the jet and plug or cap the other side, as close as possible to the jet. Note: Some jets have a barbed connector for the air (as in picture) and some have a slip connector. The air port is generally installed above the water port and will be smaller or the same size as the water port. Adapter fittings may be necessary to connect to the jet. The easiest way to connect to the air system is to find a convenient place to cut the plumbing and install a Tee connector on the line. Use a barbed connector on the third side of the T and slide the ozone line onto the barb. Ozone will be pulled into your spa when your venturi air controls are closed. Only use this method if your venturi air system works well and the valves close properly. Proceed to Step 3 and create the Hartford Loop. If your spa is filled with foam insulation and you can't access an individual jet or jet line, use an ozone injector on your main plumbing line. This is the large 1-1/2" I.D. (1-7/8" O.D.) or 2" I.D. (2-3/8" O.D.) plumbing. When you place an ozone injector on the main plumbing line, you need to plumb in a bypass so you don't add strain to your pump and drastically reduce the jet pressure when your pump is on high speed. You can purchase an injector with a by-pass already plumbed together or you can buy the separate pieces and assemble it yourself. The ozone injector should be placed after your pump, heater and filter when possible. If you do not place it after your equipment, you may not have sufficient venturi pressure and the concentrated ozone may damage your equipment over time. 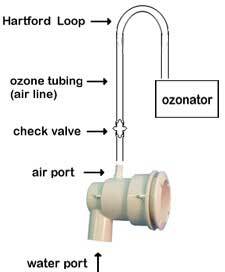 A check valve is provided with most ozonators to prevent water from back-flowing up the ozone line and getting into the ozonator. After you connect the ozone line to your spa, cut the tubing at about 6". Then reconnect the ozone line with a barbed check valve. If the check valve is not labeled with the direction of the airflow, blow into the check valve. Connect the end of the check valve that you can blow into, to the line that leads to the ozonator. Connect the end that you can't blow into, to the line that leads to the spa. Air must be able to travel from the ozonator to the spa, but water should be prevented from flowing from the spa to the ozonator. A second line of defense to prevent water from getting into an ozonator is to create a Hartford Loop. 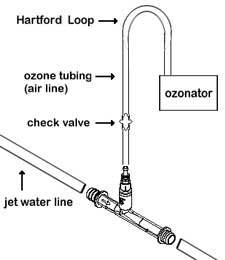 Creating a Hartford Loop simply means to loop the ozone tubing up as high as you can before you connect to the ozonator. The loop needs to go above the water line for optimal effect. Many spa manufacturers make connecting the electrical very easy by pre-wiring a plug for your ozonator on the equipment panel. Look for a female plug-in that is labeled for an ozonator. The most common plugs for ozonators are the J&J mini plug and the amp plug. Our ozonators are available many different cord options that are pictured on our individual ozonator pages. If your spa has a plug-in to accept an ozonator, you need to determine the voltage that the plug is wired for. Most ozone plugs are wired for 110 Volts even if the main power going to the hot tub is 220 Volts. Check your spa owners manual if you are unsure or consult the spa manufacturer. If you do not have an ozone plug, cut the plug off and hard wire to your spa system. (Warning: Have an electrician or local spa professional do the wiring for you if you do not understand electrical wiring. Water and electricity do not mix and a mistake could be fatal! We will not be held liable for any injuries that may result from the installation or troubleshooting of any electrical components.) If your spa has an electronic circuit board with terminals ready to connect to, please check with your owners manual or spa manufacturer for the required voltage. Ideally, the ozonator should be wired so it comes on when your low speed pump is on. If you wire to the low speed pump circuit or your spa timer, the ozonator will only be on when it needs to be, instead of 24 hours a day. If your spa has a timed filtration cycle, set the timer so your pump filters a minimum of 3 hours in every 12 hour period. Ozone will only be getting into your spa when the pump is filtering and the longer you filter every day, the more effective the ozone purification process will be! Congratulations, your install is complete! You can now use 60 - 90% less chlorine or bromine and cut down on many other chemicals. Welcome to healthier hot tubbing and a much more enjoyable spa!